Donald Trump became president in a shocking repudiation of American values—like the value that held that a person who boasted of sexual assault could not become president. Since taking the office, he has shown his disdain for not just those values but our basic laws. His ban on Muslims entering the United States defies our Constitution on a fundamental level, a gale-force test of our institutions. 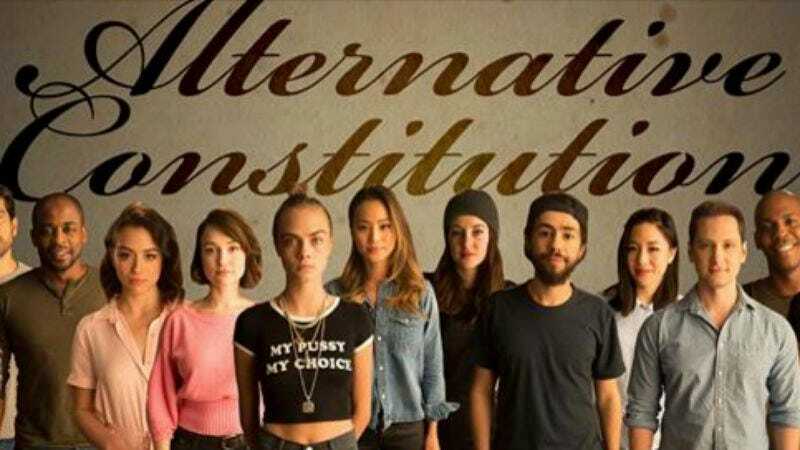 A star-studded video from Funny Or Die featuring Lizzy Caplan, Shailene Woodley, Susan Sarandon, Cara Delevingne, Amber Heard, and many more suggests: Maybe he just has the wrong Constitution? One that appends the First Amendment’s line “Congress shall make no law respecting an establishment of religion” with the qualification, “but if a handsome, brave, scared president makes an executive order that favors one religion over another, he shall only experience pure ecstasy”? Perhaps a Constitution he found in the mouth of a snake demon somewhere? The theory gets a little elaborate. It is a noble piece of scholarship, but, as Caplan concludes, “We are fucked” if Trump doesn’t get on the same page as the rest of us. The video concludes with an exhortation to call your senator to oppose attorney general Jeff Sessions. You can find all the info to oppose him, as well as Supreme Court nominee Neil Gorsuch, the creation of a border wall, the very existence of Steve Bannon, and all the other horsemen here.